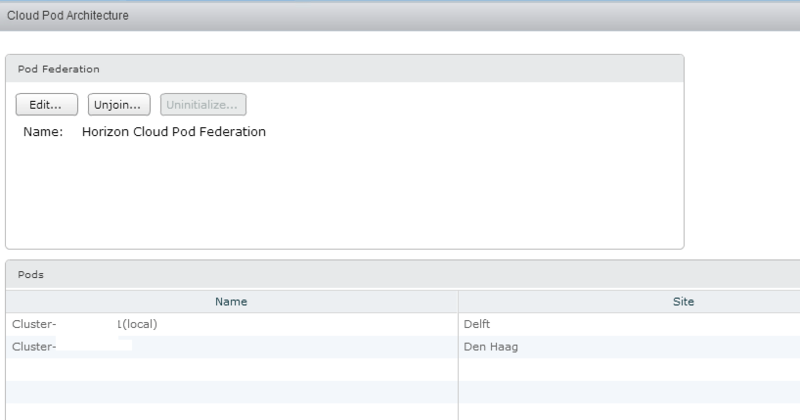 In my previous blogs I talked about the upgrade process of VMware Horizon View to version 6.1. 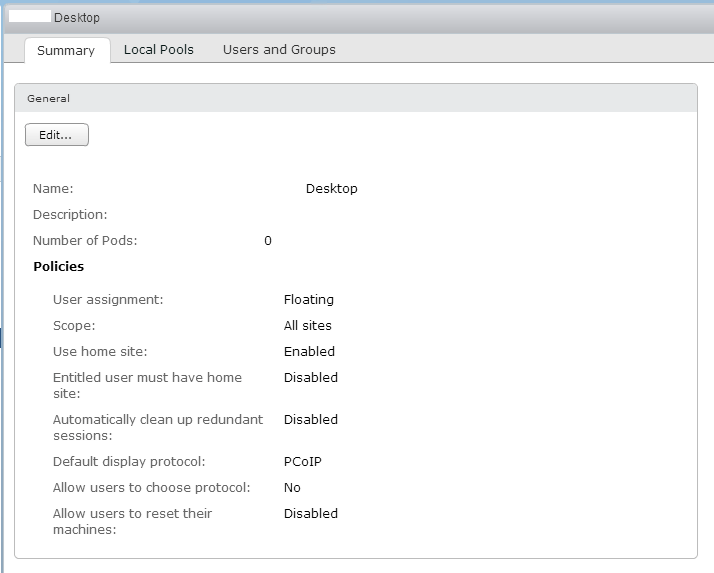 With version 6.1 you get the ability to use a GUI to create and manage a Cloud Pod. This is good news for before you had to work with a command line tool as I wrote about before. I kinda liked the command line tool but have to say the GUI looks well thought off and works like expected. 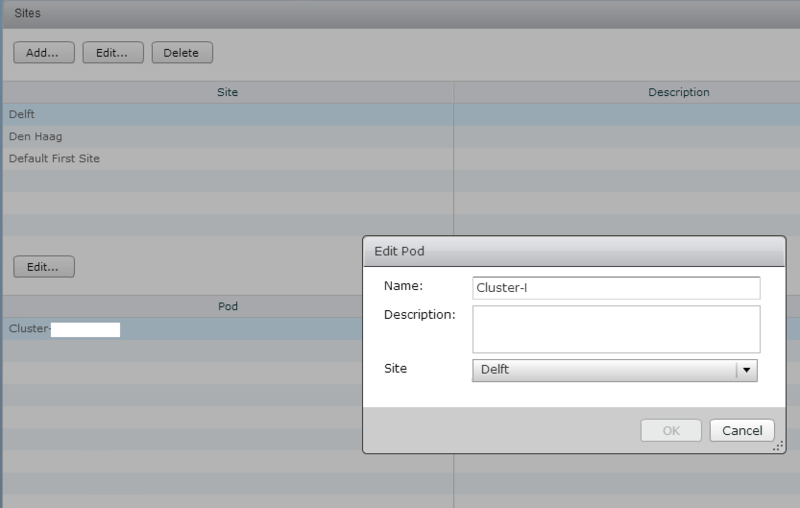 In this blog I will shortly show you what the new Cloud Pod GUI gives you. First let’s take a look at console changes, of course the GUI adds some new features to the console. 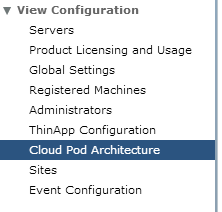 If we look under View Configuration you notice there is a Cloud Pod Architecture option now. The first setup of the Cloud Pod is done from the Cloud Pod Architecture, after that you add the sites to the configuration as you would have done with lmvutil. As shown in the picture above the initial setup of the Cloud Pod is done here, here you can edit the name if you like. If you want to edit the sites or add a site to a Cloud Pod yo have to go to the option site. From the sites option in the menu you can select which site is connected to which Cloud cluster. I set all this up with lmvutil already so it was configured. 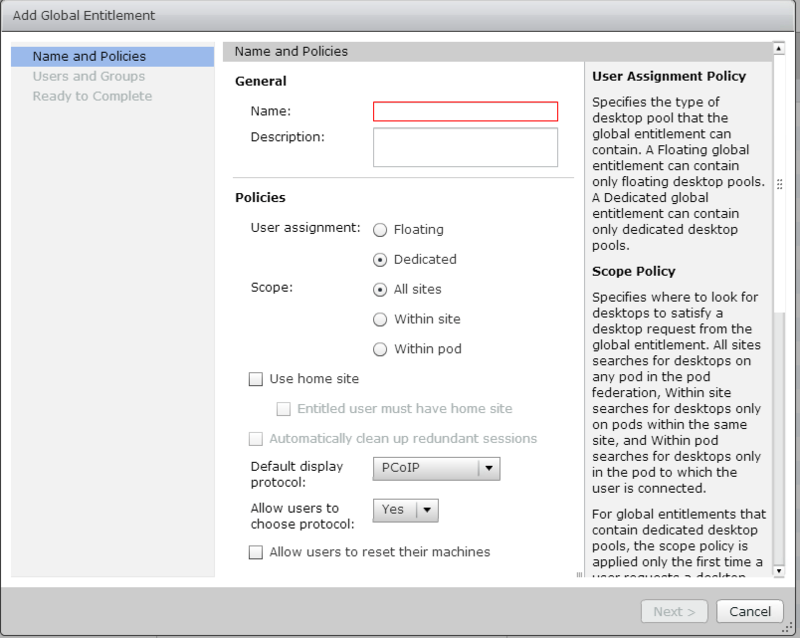 Under the Catalogs you find a Global Entitlements option.You create a Global entitlement and add the desktop pool to that entitlement. If you click on it you will see all Global entitlement that are available. Clicking on Edit will give you some options for this global entitlement but not all of them. If you really want to change certain settings you need to create a new one. Editing will give you the option to change the scope and the protocol used, it will not give you the option to change the assignment or if the protocol can be chosen. Adding a Global Entitlement will give you all options. 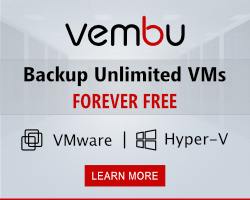 when you select use Home site you will need lmvutil to add the connection to the home site for the user or group. I haven’t seen an option in the GUI yet to do this (perhaps I missed it). If you have the Global entitlement ready you can add the desktop pools. 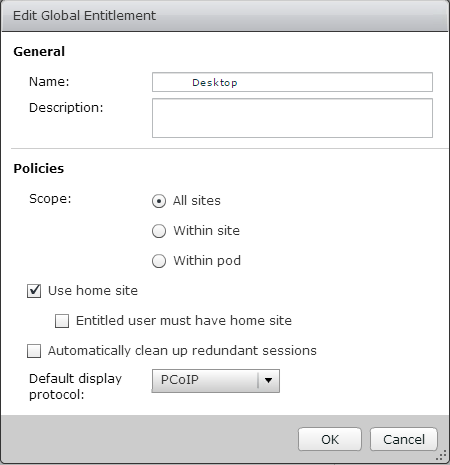 You simply click on the Global Entitlement name and the screen to edit will open. You can see a summary of the entitlement you made and add the local pools or user and groups here. The GUI really adds value to the console, there are a few options I’m missing but that might just be time before I find them.The GUI is logical and very easy to use, I think a job well done.